MONACO — Here in the conspicuous consumption capital of the world, you might feel slightly naked without your exotic Ferrari or Lamborghini as you cruise the Cote d’Azur in search of handmade perfumes and instantly distilled envy. But it’s best to leave them at home, really: driving your supercar can really be a drag here, since one of the premium products adored locally is parking. Just try to find a slot for even the mini-est MINI when hordes of gawkers descend to soak up the Frisco fog of ultraluxury. Unless your name begins with Prince, it’s going to take some circling. Audi can’t help you with the envy thing. But the parking thing’s a breeze with the A3, the most compact of Audi’s cars conveyed to North Americans. (There’s an aluminum A2 city car sold in Europe, but its tall-narrow-short monospace shape seems to be missing its Matchbox logo along with its entry visa.) 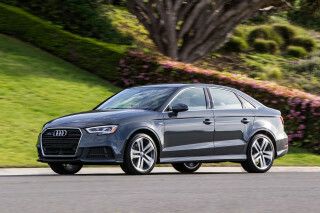 The A3 five-door will rightly be known with the suffix Sportback when it migrates to the States, and will be pitched at those hazily defined active-lifestylers who never sit down long enough to be properly tagged for observation. 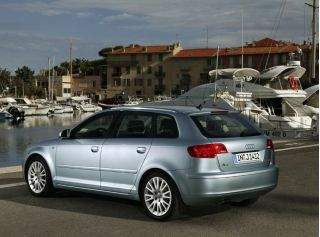 The Sportback treks across the Atlantic in May 2005 as the entry-level vehicle in the brand’s U.S. lineup. At about $25,000 base, the A3 Sportback will occupy a unique niche that’s not quite station wagon and not quite hot-hatch. 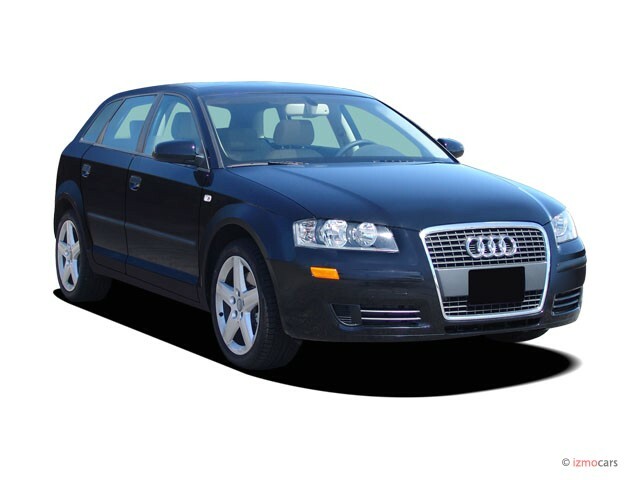 Audi poses the Mazda3, Saab 9-2X, MINI and other jazzy more-than-two-doors as possible competition, but given its upscale heritage and five-door format, it’s difficult to pin down exactly what you’d price out on Edmunds or Kelly Blue Book before going out to comparison shop. Don’t get too caught up in trying to categorize the Sportback. It’s way more engaging to drive one and figure out all the things you could accomplish in it: zip around the Cote d’Azur trying to re-locate the cleverly hidden airport in Nice, for example, or stuffing it with snorkels, swim fins, and a picnic basket laden with salade Nicoise. The Sportback’s roomy enough to take on all these tasks, and actually, it’s roomy enough to displace a few shoppers out of the more expensive and not much larger A4 sedan. Though a full-fledged Audi, the Sportback has more in common with its country cousins in Wolfsburg. As the A4 family shares some genetic traits with the Volkswagen Passat, the Sportback’s underpinnings presage those in the fifth-generation Golf that we’ll see Stateside in mid-2006, first in the new VW GTI. In its initial offering the Sportback will be a front-drive model, with a six-cylinder-powered, all-wheel-driven, DSG-geared 3.2 S model to come in calendar year 2006. If the Sportback were in primary school it would be admonished for being a “me-firster.” Not only does the architecture show up in the States before the hardy perennial Golf, it drags with it a new turbocharged four-cylinder engine that swirls its gas-air vapors into a tizzy with some world-first technology. Euros will be well confused by their Sportback’s choice of seven engines, including two diesels. Audi has simplified the offerings down to two powerplants for single-minded Americans, though. And initially, it’s just VW/Audi’s newest 2.0-liter, turbocharged four that gets its passport stamped. Rightfully so, Audi crows that the engine is the world’s only turbo four with direct injection. A techno milestone, the engine outperforms the company’s older turbos and seems much happier about the task of breathing out 200 horsepower and 207 pound-feet of torque. The powerband is a wide one, the throttle sweetly tuned for quick tip-in, and the torque curve’s as flat as can be expected from a turbo. More important for Audi’s upmarket crowd, the turbo four sounds and feels as silky as a six-cylinder, with very little whistle and roar passed through to the Sportback’s cabin. Teamed to a short-throw, snicky six-speed shifter, Audi says the base Sportback will hustle to 60 mph in less than 7.0 seconds and will top out at 130 mph. As it’s kin to the evergreen Golf, the Sportback’s suspension is far from mysterious. Front MacPherson struts and a four-link design in back offer up a deft combination of grip and poise that, no surprise, are pretty reminiscent of the most recent GTI. We zigzagged our car up Provencal hills in search of perfect vistas and perhaps a clean toilette, and the Sportback took on 15-degree hairpins and long, gradual curves with universal eagerness. It pretty much campaigns to be your best friend, never really complaining when you push it deeply into corners, scrubbing off speed with just a little tire whine and never transmitting more than a firm thwop and a slight jostle into the cabin. Part of the joy of the Sportback’s demeanor is realizing that at least one company can tune an eletromechanical power-steering rack and endow it with true feeling. Drive a Saturn ION and a Sportback and the ION’s steering gear will stand out like William Hung opening for the Three Tenors. Audi’s setup is full of feedback, appropriate heft, and linear response. The Sportback’s brakes feel strong and powerful, too, with ideal pedal feel and travel. Dimensional analysis of the Sportback finds that the wheelbase has grown versus the original, non-U.S.-market A3. Subjectively the interior package seems substantial enough for four adults, especially in the front seats where shoulder room is amply broad and the ceiling height is suitably tall. It’s in the rear where things get a little tight: with the driver-side chair pushed to reasonable six-foot comfort, adult rear passengers will have knee and toe room enough to wiggle out of their fair share of driving, and enough head room to keep from Velcro-ing their hair extensions to the fabric headliner, but not much more. As for versatility, the Sportback will stow 13.1 cubic feet of stuff behind the rear seatbacks, or about 41 cubic feet with the 60/40 rear bench seats folded down. Hardwired into the Sportback’s unibody is an extensive array of safety gear. Dual front and side-curtain airbags are stitched and tucked into the dash and door trim, active head restraints are built into the seats and stability control is programmed into the vehicle’s mainframe, along with anti-lock brakes and traction control. Audi’s framed the A3 Sportback with its toothsome new grille, a tall metallic-ringed affair that will take some time to appear natural. One instant bold and tasteful, the next instant it seems ready to vacuum the road. The silhouette from sideview is taut and pleasing and more finely detailed than any of its general competitors, excluding the exquisite MINI. Inside the Sportback’s a slight step down from Audi’s benchmark interiors in the A4 and A8. Ergonomically it’s faultless: the three-spoke steering wheel frames the gauges perfectly and tilts and telescopes for a custom fit, and the seats are supportive, firm and stuffed in the right places. Still, it’s unusual to sink into a cozy Audi cockpit and not find the ubiquitous wood trim. In America, aluminum trim will decorate the interior. The least Audi-like material sits atop the dash — a rubberized plastic cap that’s more open-grain than the textures you’ll see on A4 Avants. The DVD-based navigation brings the VW empire into technological harmony with the rest of the world (some VW navi systems in the U.S. still use CD-ROMs, and require a changer to hold all the discs). Not only does the Audi DVD navi we sampled have a DVD mated to a CD changer in the glovebox, it also has a pair of SD card slots tucked behind the six-inch LCD navi/radio screen. Controlled with Audi’s MMI interface, the navi/radio setup probably is the easiest, most user-friendly of the group that includes BMW’s unfortunately dense iDrive and the sometimes impenetrable Benz COMAND system. You’ll think it’s the Roaring Nineties again when you scan the list of standard goodies. Every turbo four Sportback shipped to the U.S. will be crammed with 17-inch alloy wheels, an AM/FM/CD player pre-wired for satellite radio, dual-zone climate control, power windows, central locking and an alarm. The options list will offer up an Open Sky panoramic sunroof, a Bose sound upgrade, a DVD-based navigation system, xenon headlamps (bi-xenon lamps yet to come on the V-6), leather trim, a power driver’s seat, rear side airbags, heated front seats. The Sportback 3.2 ponies up to sport seats, a special grille and door sill trim, new bumpers, a roof spoiler and fog lamps. A tasty blend of Audi heritage goes into the A3 Sportback. It feels as nimble as the old Coupe GTs with the versatility of the smaller A4 Avant, and sits more sleekly than either. Audi plans to sell about 20,000 each year in the U.S., with 16,000 turbo fours and 4000 DSG V-6 Sportbacks baked into the marketing plan. Even given the charming choices it’s up against, the Sportback seems destined for an active lifestyle all its own.